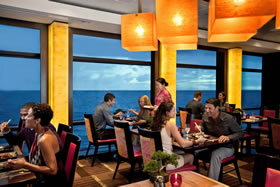 Join Pied Piper Travel and Celebrity Cruises as we once again return to the beautiful islands of Hawaii! 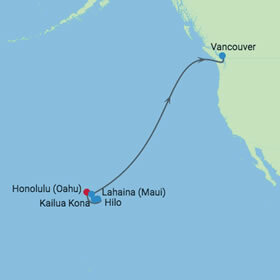 You'll sail on this wonderful 11-day journey from Honolulu to Vancouver, Canada, to these incredible Hawaiian Islands: Oahu, Maui, and the 'Big Island' of Hawaii! 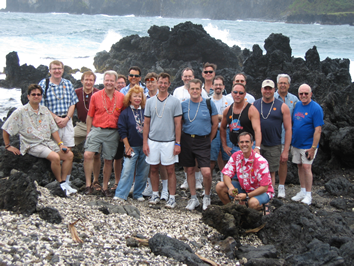 One other exciting feature of this gay group cruise is an evening sail by Mount Kilauea, an active Volcano! 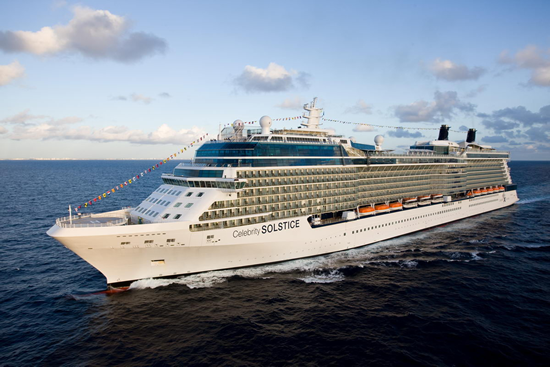 And, we'll sail on Celebrity's beautiful ship, Solstice ! Hawaiian for "Our house is your house," and what a house it is. From palm-fringed beaches and indescribable sunsets, to emerald green rainforests and thunderous volcanoes. Experience a land that is open and welcoming, yet marbled with mystery. 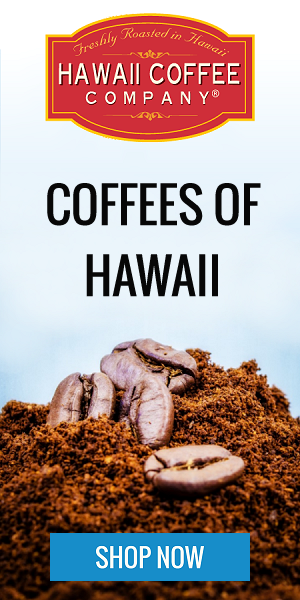 Whether your vision of Hawaii conjures up images of moonlit beaches or dancers taming batons of fire, you'll see the Hawaii of your imagination and the Hawaii that will defy it. 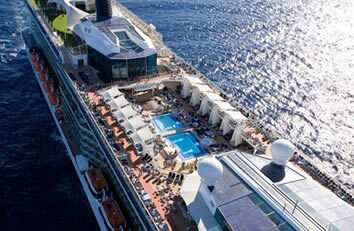 Escapes do not come more unforgettable than a Hawaii cruise. 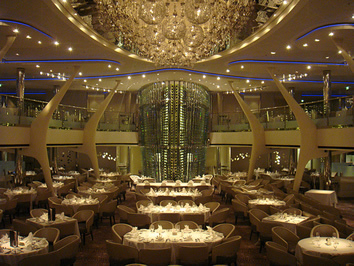 Enjoy the finest cuisine and world-class relaxation – whether on the beach of a Hawaiian island or the deck of your Celebrity Cruises ship. The Hawaiian Islands are an icon of tropical luxury, where sun, sea and sand are more than words on a postcard – they are a way of life. Beaches fringed with palms and volcanoes quietly bubbling away are just two of the reasons why Hawaii cruises are perfect for when you need to get away from it all. Whilst the palm trees sway and blue waves roll against golden sand on the shore, you can relax on the deck of your award-winning Celebrity Cruises ship. 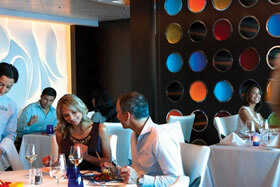 Choose exactly how to spend your time on your Hawaii cruise – enjoy an on-shore adventure or take on a voyage of international flavours thanks to the first-class gourmet dining in one of the many restaurants on board. 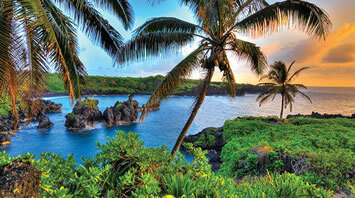 Many people dream of visiting Hawaii, and it is not hard to see why. Even in the capital city of Honolulu, you will find some of the world's most spectacular waterfalls. Explore the heritage of this fascinating town and take a calming walk around the coast. 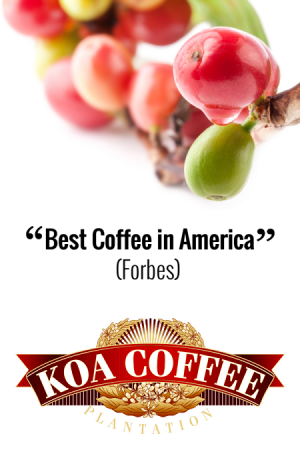 Hawaii's capital is indeed the jewel city of the Pacific. From Diamond Head and the world-famous beaches of Waikiki, to the inspiring memorials of Punchbowl National Cemetery, to the only royal palace ever constructed on U.S. soil. Honolulu offers multiple attractions, from Pearl Harbor to Iolani Palace—a landmark listed on the National Register of Historic Places. 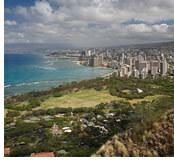 You'll enjoy exploring this city, which seems to rise up out of the lush Hawaiian flora. The most prominent feature in Maui is Haleakala, the world's largest dormant volcano, rising 10,000 feet above sea level. The term dormant applies only to the volcano, for on the lower slopes of Haleakala you'll find emerald meadows and flower farms: all accessible from the historic town of Lahaina. If you're fortunate enough to be here between the months of December and March, you could witness one of nature's great spectacles: the annual migration of humpback whales returning to their winter home. Located on the breathtaking Kona Coast, Kailua Kona is a lively village of shops and galleries where the warm aloha spirit is a way of life. King Kamehameha, the man who united the Hawaiian islands, loved the area so much that it was not only his summer getaway spot, but also where he lived out the later part of his life. 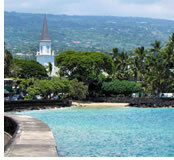 The history is well preserved at sites like Hulihee Palace and Mokuaikaua Church. 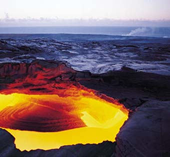 The Big Island has grown over 500 acres, thanks to the active nature of Mount Kilauea, Hawaii's youngest volcano. This molten masterpiece alsohappens to be one of the world's most active, and likes to show off when the sun goes down. You'll have a front-row seat to this nighttime spectacle, watching as the fiery lava flows blaze down the mountainside while you cruise by. You'll never think of fireworks the same way again. 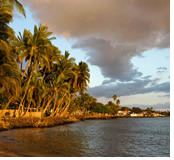 Located on the lush coast of the Big Island, Hilo is the capital city of Hawaii. 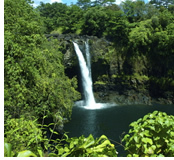 Hilo is also where you'll find two of the most spectacular waterfalls in all of creation: Rainbow Falls in the south and the mammoth Akaka Falls in the north, which sends hundred of thousands of gallons of water plummeting over a volcanic cliff. 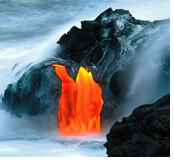 Hilo is also home to Volcanoes National Park and the imposing Kilauea Volcano. 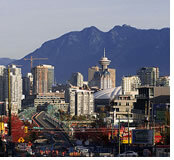 Vancouver is the largest metropolitan area in Western Canada, and third largest in Canada. Located at the southwestern corner of the coastal province of British Columbia, it is well known for its majestic natural beauty, as it is nestled between the Coast Mountains and the Pacific Ocean. 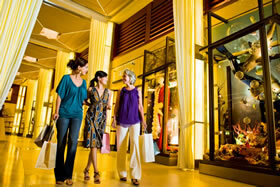 It is frequently ranked as one of the "best cities to live in" and is certainly a beautiful destination to visit. 06 May A Day at Sea! 08 May A Day at Sea! Z - Inside Double Stateroom Guaranty* Sitting area with sofa, 32" LCD TV, wireless connection, vanity, two beds convertible to queen size, bath with shower stall and washbasin. Some cabins may have a trundle bed. 183 sq. ft. - 200 sq. ft.
Y - Ocean-view double stateroom with window Guaranty* Ocean view window, sitting area with sofa, 32" LCD TV, wireless connection, vanity, two beds convertible to queen size, bath with shower stall and washbasin. Some cabins may have a trundle bed. 176 sq.f. 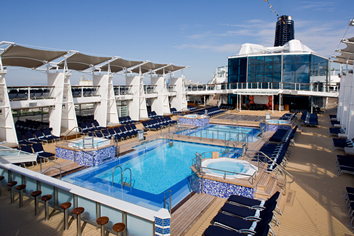 XC - Concierge Class double staterooms with veranda Guaranty* Floor-to-ceiling sliding glass doors, sitting area with sofa, 32" LCD TV, wireless connection, vanity, two beds convertible to queen size, bath with shower stall and washbasin. 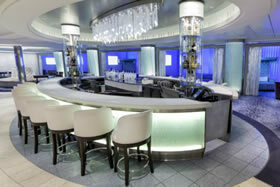 Additionally, suite veranda features lounge seating. Some cabins may have a trundle bed. 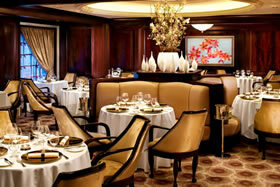 Stateroom: 192 sq. ft. Veranda: 53 sq. 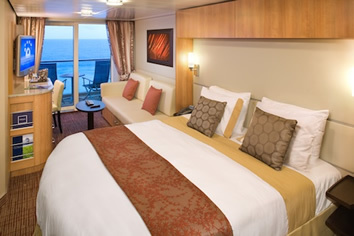 ft.
XA - Aqua Class stateroom with veranda Guaranty* Floor-to-ceiling sliding glass doors, sitting area with sofa, 32" LCD TV, wireless connection, vanity, two beds convertible to queen size, bath with shower stall and washbasin. 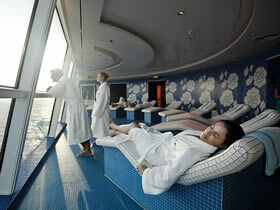 A brand new class of staterooms on Celebrity Solstice, AquaClass brings a tranquil, relaxing atmosphere into your stateroom, while providing unlimited access to many of the AquaSpa® amenities. 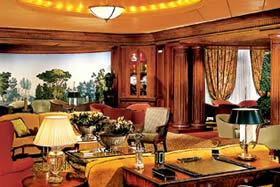 Stateroom: 192 sq. ft. Veranda: 53 sq. ft.
W - Suite with veranda Guaranty*	 Floor-to-ceiling sliding glass doors, living room with sofa queen sleeper, mini refrigerator, 40" LCD TV, wireless connection, vanity, two beds convertible to queen size, bath with shower/tub combination and washbasin. 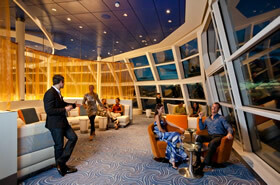 Additionally, suite veranda features lounge seating. 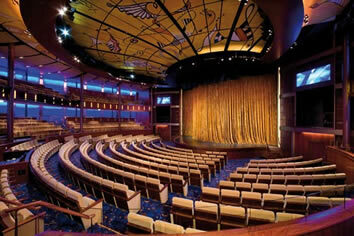 Stateroom: 300 sq. ft. Veranda: 77 sq. 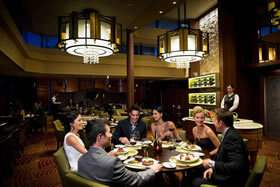 ft.
Taxes of $94.45 pp, optional travel insurance, and gratuities are additional. GO Big! Book an Oceanview stateroom or higher and get two of the following: a complimentary Classic beverage package, complimentary gratuities, unlimited onboard internet, or an onboard credit of $300 per stateroom! GO Best! Book an Oceanview stateroom or higher, and for only $45 per person, per day extra, receive all of the following: a complimentary Premium beverage package, complimentary gratuities, unlimited onboard internet, or an onboard credit of $300 per stateroom! Suite deal! 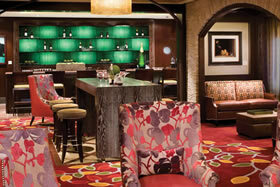 Book a suite and get all of the complimentary perks at no additional charge!